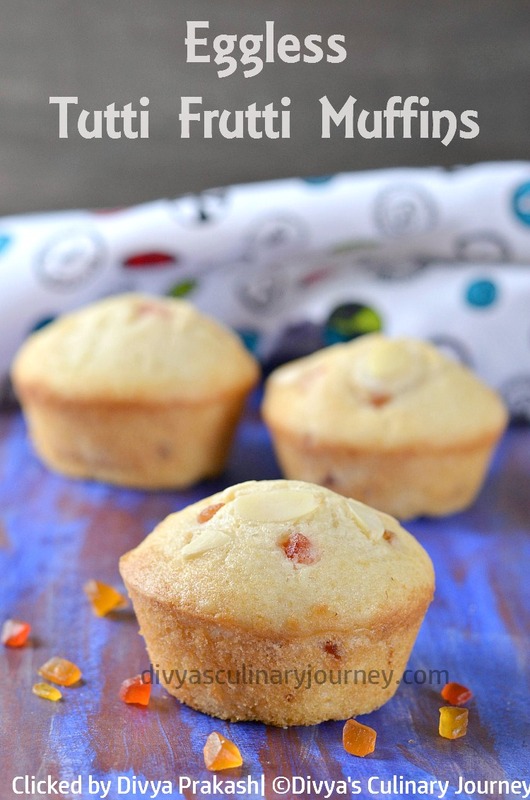 I baked these muffins today and my kids loved it so much and it vanished quickly. This recipe is easy to follow and quick to prepare too. It took around 30 minutes from start till end. If you have to prepare a quick snack to serve kids, then you can give this a try. This will definitely be a hit with kids who have sweet tooth. 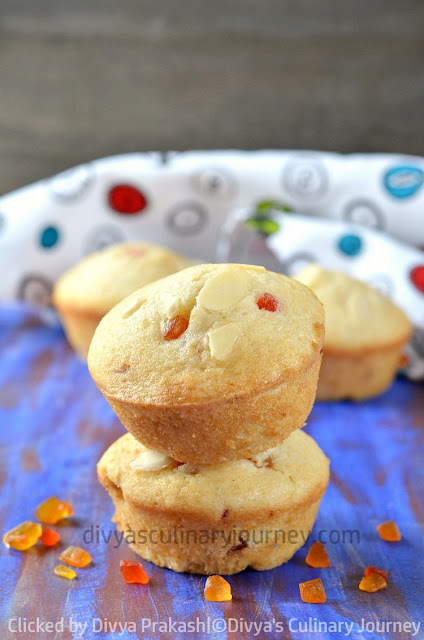 Easy recipe for soft muffins with tutti frutti made without egg. Preheat the oven to 350 F / 180 C / 160 Fan / Gas mark 4. Prepare the muffin pan by greasing and flouring it. In a bowl, sift together all purpose flour, corn flour, baking powder, baking soda, salt and keep it aside. In another bowl, whisk yogurt and sugar together. Then add milk, oil, vanilla extract and mix well. To this yogurt mixture, add the flour mixture little by little and mix well to form a smooth batter. 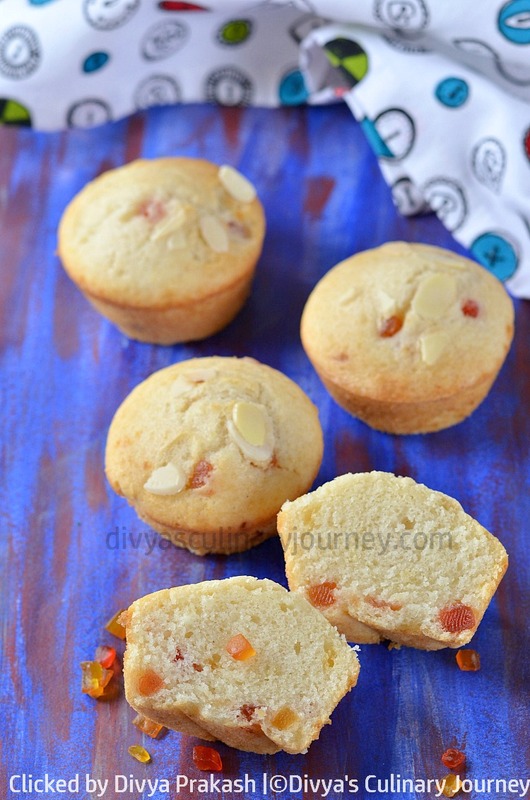 Add tutti frutti to the batter and mix such that they are evenly distributed in the batter. Fill the prepared muffin pan such that each cup is about 3/4th full. 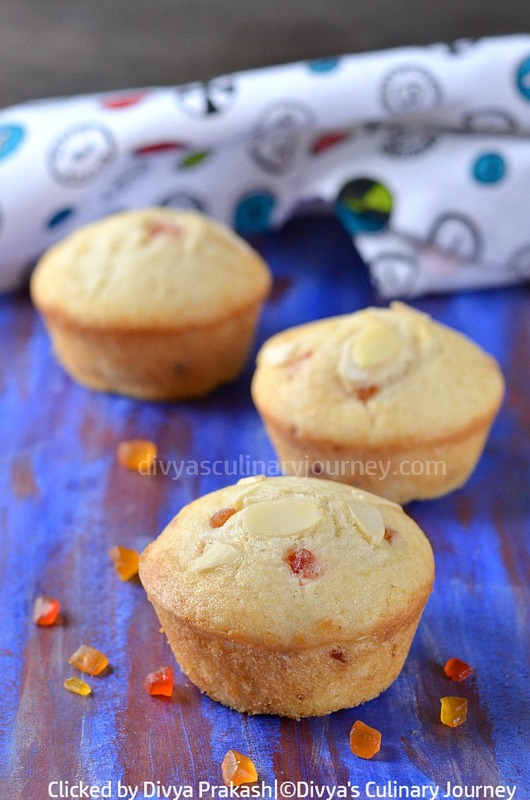 Optionally, you can top it with sliced almonds. Bake in preheated oven for about 15 - 20 minutes till the muffins are done. Let it cool for 5 minutes. Then remove from the pan and let it cool completely. Then store it in airtight container and serve it when you need. As tutti frutti is sweet, you can adjust the quantity of sugar added to this recipe to suit your taste. I added 1/2 cup of sugar. But if you want it more sweet add 3/4 cup of sugar. Baking time varies with each oven. Check yours accordingly.